In SAP Business Objects 4.x Web Intelligence the Charting Engine has been enhanced and comes with many new chart types and customizable properties. We can format the chart type at a high level to use three styles namely Normal Style, Flashy Style and High Contrast Style. This can be chosen from Drop Down List of Chart Style Formats for Format Tab (Right End) when we select a chart. We can also use Chart Format Properties Dialog Boxes to manually also customize the format and layout and look and feel of the chart to achieve the same. And though there are many properties, in this section we scope our discussion to using of properties of Lighting and Shadow Effects. The option can be found in Chart Format Properties (Select Chart – Right Click) – Global Menu – Color Palette Settings – Lighting and Shadow Effects. There are 8 possible choices namely – No Filter, Simple Lighting, Simple Shadow, Simple Lighting and Shadows, Real Lighting, Complex Shadows, Real Lighting and Complex Shadows, and image embossed with lighting and complies shadows. 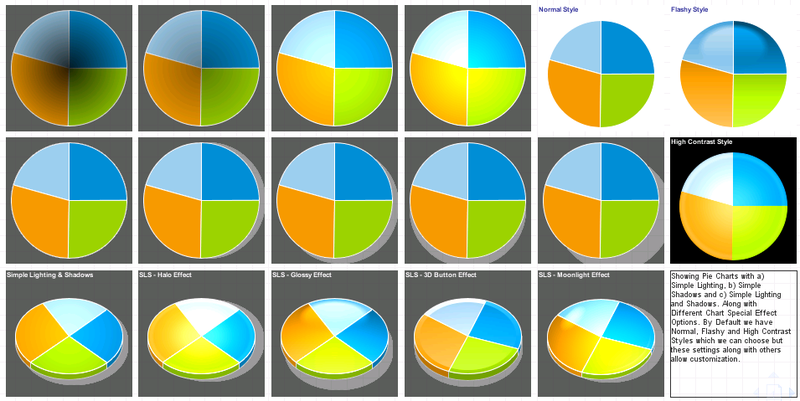 Below Snapshots shows a Pie Chart formatted using Normal, Flashy and High Contrast Styles to the Right End and the rest of Pie Charts frames show how settings can be changed to add more lighting power, shadows, angle of shadow display and complexity of shadow and also show some 3D Chart series styles with Simple Lighting and Shadows choice. First Row show Lighting Power from Dim to Bright using Simple Lighting. Second Row show change in angle of Shadows using Simple Shadows. Third Row shows 3D Charts with different style Effects such as Halo, Glossy, Flashy, Button and Moonlight and Simple Lighting and Shadows. Basic Settings are described as below: a) Light Power: Range Value, which can be changed to add more lighting or dim the sectors of pie chart. b) Shadow X / Y Offset: Range Value, which can be changed to display shadow at different angles, just like shadow location changes due to change in sun angle. c) Shadow Color: We can change the Shadow Color using RGBA or Gradient and not just use dark grey color. d) Filter Pass and Widow Settings are used for smoothness and complexity effect of shade. We can also make sector of chart glossy, flashy or keep them normal and based on different types of charts properties. In in this section we see set of Pie Charts whose display has been changed based on Simple Lighting and Shadows. Next Section we will see few more Lighting and Shading Effects in detail. In Conclusion Web Intelligence Reporting has been upgraded and enhanced for great Chart Display. Typically this level of good looking charts primary existing in XCelsius / Dashboards originally but now Web Intelligence can be used to create great looking crisp visualizations.